We’ve teamed up with Jimmy Hagood and Will Harris to deliver—literally—some of the best barbecue you’ve ever had anywhere in America. Jimmy is a pitmaster from Charleston, South Carolina. With his company, Food for the Southern Soul, he makes a superlative version of the region’s whole-hog, wood-fire barbecued pulled pork. Will Harris is a 4th generation rancher whose farm, White Oak Pastures, in Bluffton, Georgia is a leader in sustainable animal husbandry practices. 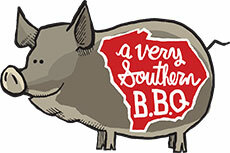 Michael Pollan once said, "The dark side of Southern barbecue is that it’s based on commodity pork." Will's meat is the polar opposite. He's raising heritage-breed Berkshire hogs on the ranch, which has an on-site abattoir, and sending three or four a month over to Jimmy to cook just for us. Jimmy dry rubs the full-flavored pork with herbs, spices, and evaporated cane juice, which makes for a mahogany finish as it roasts over charcoal and pecan wood for sixteen hours. The meat is all hand picked and packed into two pound bags, ready for you to heat and eat with one of the trinity of South Carolina sauces. Tangy and tart, the most distinctive of South Carolina’s styles. Made near Holly Hill and Columbia, where Germans settled. The sweet, easy-to-love style from Greenville and Spartanburg. Most barbecue you’ll find has taken some short-cut—either the animals are raised in commodity conditions, or there's no lengthy cooking time in wood smoke, or it’s not whole animal hand-picked meat. This has no short cuts, only long cuts, leading to the most delicious barbecue that you’ll get delivered. Makes a great gift for the barbecue fan on your gift list. The pulled pork ships frozen in a sealed plastic bag. The pork needs to thaw in the fridge for about twenty-four hours before reheating. After it's thawed, reheat the whole bag in a large stock pot of boiling water for thirty minutes, remove from the bag, mix in your sauce and serve.